Day 16 is pretty momentous as it involves not only the 16th Radiotherapy session but also, straight after the 2nd and FINAL chemotherapy session. I can't deny I was rather apprehensive as I arrived at the Cancer Centre at 8.30am this morning. We saw Frank and his wife there early too - as he is meant to have chemo today too. I walked up the stairs to Ward 202, then round to the chemotherapy pods. I got to choose my seat this time and got one by the window. I could see grass and sunshine and a very fat Wood Pigeon wandering around in circles pecking at the ground. Very relaxing. I got the same nurse to look after me all day - the very helpful and nice Sarah. She set me up with a cannula in my wrist. I still have a sore bit where the last one went in so she chose a different vein on the underside. She said it would hurt a bit going in as there are lots of nerve endings on that side. She wasn't wrong :-) Then she put up the first 2 hour bag of saline to hydrate me nicely before the cisplatin went in. I got chance to sit and relax and read Therapy for a while. Frank arrived upstairs and got the window seat opposite me. \however when the nurse came to him they said that his blood results weren't good and they needed to talk to Dr Gahir before going ahead with chemo. They took more blood and he had to wait around until the lab had processed them. The count had hardly gone up so it was decided that he should go home and they'd have another test later in the week. ﻿﻿It must have been a bit gutting to psych yourself up for this then not get in done. I was told my results were fine and was soon on the scary RED bag - which once again took 3 hours to go through. I had a few issues with the needle being on the underside of my wrist - very near to where it bends. If I moved my hand at all it set off and alarm and the pump stopped working. It seemed to happen every time I went to the toilet. Well, have you ever tried to pull up your jeans and fasten them with one hand?? Give it a go - it's almost impossible. Sarah has great hearing and can hear one of the alarms kicking off from anywhere. She always appeared calm and collected to put it right again. So I had the new anti-sickness drug - EMEND. Also had stuff injected too - so felt pretty good during the day. I managed to drink lots of water, tried a mug of tea - still horrible and had quite a few tuna mayo sandwiches. The advice out on the Internet about chemo always says that you should never eat or drink stuff you actually like during it - otherwise it is always gong to have horrible connotations for you afterwards. So it could be that I'll never be able to look at a tuna sandwich or a grape ever again after all this is done. My mum and dad have taken to sending me a card after I have completed each week of treatment. Isn't that a lovely thought? The only thing is they are trawling back through the mists of history to find some pretty embarrassing photos of me to put on them. 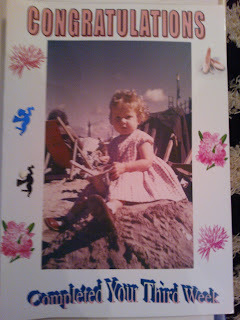 This is the only one I don't mind showing you - me about 2 years old in Blackpool, which they sent at the end of week 3.